January 24, 2019 | Drexel Hill, PA – The Lansdowne Symphony Orchestra under the musical direction of Reuben Blundell, presents a concert on February 10 featuring guest artist, violist Roberto Díaz, president and CEO of the Curtis Institute of Music. Tickets for the concert are $20 for adults, $17 for senior citizens, and $5 for students and may be purchased by calling the box office at 610.622.1189 or by visiting www.udpac.org. Upper Darby Performing Arts Center is located at 601 N. Lansdowne Avenue in Drexel Hill. Parking is free. For more information on the upcoming season visit http://www.lansdowneso.org. The afternoon opens with the “Overture” to Dame Ethel Smyth’s grand opera The Wreckers. Ms. Smyth (1858-1944) was an important figure in music, feminism, and English history. Her work is featured in a collaboration with international publishers and libraries including the Royal Academy of Music, Philadelphia’s Fleisher Collection, and Lawdon Press in a series of programs featuring works by female composers. The second work is the “Viola Concerto” by William Walton (1902–1983), one of Walton’s best-known works. 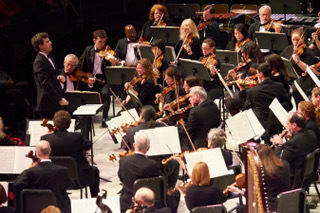 The orchestra welcomes viola soloist Roberto Díaz for the concerto. The orchestra will conclude the afternoon with “Symphony No. 4 in E Minor” by the German composer and pianist Johannes Brahms (1833-1897).